Almost two years ago, I replaced one of my single-sided (SS) ST drives with a double-sided, double-density (DS/ DD) drive. As time went on, I found myself getting more and more frustrated each time I'd get the "Drive B doesn't respond..." window, finding that I had once again erroneously inserted a DS/DD-formatted disk into my single-sided disk drive. I rationalized that while it would be time-consuming to transfer those zillions of files from SS disks to DS, the purchase of an additional DS disk drive wasn't really going to cost me all that much if I considered the extra disk capacity I'd have available. Once I'd convinced myself that this was the right move, I set out to convince my husband, Carl. Carl agreed that something needed to be done. After some discussion on the subject, we ruled out adding a hard drive because, although I envy the 20-megabyte Supra Carl bought a year ago, I would still have the incompatible disk formats. So, I added a hard drive to my wish list and started to research the DS drives available. Looking through some back issues of user-group newsletters, I found something of interest written by MVACE (Miami Valley ACE, Huber Heights, OH) Secretary-Treasurer Marty Freed. He described IB Computer's dual-drive setup. Carl has a Shanner drive, which is a similar setup, housing the two drives in one case. Shortly after Carl purchased his, we had looked into getting a Shanner dual drive for me as well, but Shanner had since gone out of business. Because the IB drives only cost about $100.00 more than just adding an Atari DS/DD or GTS-100, we decided to go ahead with the IB drives and keep our Atari SF354 as a back-up drive, should any of our units ever have to go in for service. Assembly, however, was not all that difficult. I simply handed the entire bundle over to my husband and asked him to do it. All told, it probably took him about an hour to complete the job. The case and the power cord are already assembled. Next, because the drives both come preset as "Drive A," you must reconfigure one as Drive B. With the drive turned over so that the electronics board is facing you and the connector is up, there are three rows of five pins each, with two small black shorting plugs just below the connector. 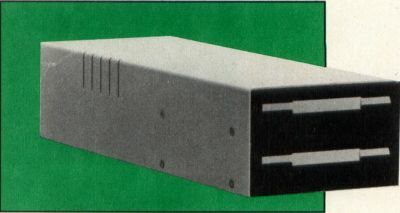 The Drive A configuration has one in the upper left connecting rows 1 and 2, with the other plug in the lower right connecting rows 2 and 3. When the lower right plug is moved over one column to the right while still being connected to rows 2 and 3, the drive is configured as Drive B. Both 34-pin edge connectors on the data cable are wired identically. Connect the bottom (Drive B) drive's data connector and 34-pin edge power connector. Then insert the four flathead screws for Drive B into the bottom of the case and align and secure Drive B to the case. Finally, insert the two small flathead screws into the top of the metal case in back of the vents. Now, as soon as you connect the drives to your computer, you are in business. Carl called IB Computers to confirm the above-described alignment, and while we did not get the name of the technical support representative he talked to, he was courteous and helpful in answering Carl's questions. After almost a year, my drives continue to work flawlessly. I'm not one for getting into computer and peripheral performance/benchmark tests, but so far my drives have done all I have asked of them. They work with every copy program I've tested them with (i.e. ProCopy, X-Utility, etc.). They've accepted my requests to format disks up to 800+K. The IB service representative also assured us that while some Atari drives made by Chinon will read but not write to tracks 81 and 82, those drives are made to Atari specifications, not Chinon's standard drive specs. Because the IB drive arrangement uses the unaltered Chinon drives, they will read and write to those tracks, should you choose to do so. I am now convinced that I lose some disk reliability when formatting my data disks to that capacity and now choose to limit my disks to 80 tracks with ten sectors per track; however, some copy-protection schemes involve those final two tracks. If you want to back up those disks, you must have a drive that will write to those tracks. Also, the drives are relatively quiet. The first week or so I had them in operation, whenever I'd first power up the drives the initial head rotation(s) created a sound somewhat similar to a migrating goose somewhere off in the distance. Now there's simply a quick, low whooshing noise and then silence. I'm pleased with my purchase. One of my only two complaints pertains to IB Computers themselves. I had originally ordered my drives on a Thursday, hoping to have them by the following weekend. The gentleman who took my order explained that since the drives wouldn't be shipped until the first day of the week, I should spring for the extra four bucks for UPS Blue Label shipping, which would ensure I'd receive them the second day after shipment. Considering the distance between Oregon and Ohio, that seemed reasonable. Two weeks later I was still waiting for my disk drives. So I called IB, only to be informed they had inadvertently set my order aside, apologized for their oversight and then processed my order; I finally received the drives two days after that. My other complaint deals with the fact that I was not informed there would be a VISA surcharge. I always try to obtain the final invoice amount total so I can keep immediate records to verify against my VISA bill. The gentleman taking my order was vague, stating something about the uncertainty of what the final package would weigh and that he needed that weight to compute the shipping charges, etc. He convinced me, because I hung up the phone only knowing approximately what my drives were going to cost. Now, in hindsight, I can't help wondering whether they were trying to bury the VISA surcharge. While I wholeheartedly endorse the drives, I do fault IB's customer relations. Anyone with a credit card knows they occasionally pay a surcharge for that convenience, but in this case, having that surcharge tacked on along with paying an additional Blue Label shipping charge for a set of drives it took me 2½ weeks to receive has me a little upset. 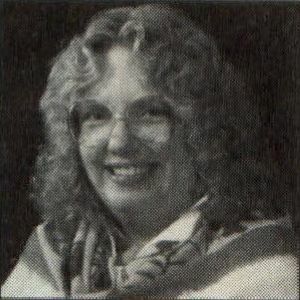 Pamela Rice Hahn has been an Atari enthusiast for five years. An active member of MVACE and the former editor of The TCAUC Newsletter, she continues to dispatch at a small-town police department to help support her family's computer habit, all the while dreaming of someday fulfilling her desire to become a fulltime freelance writer.